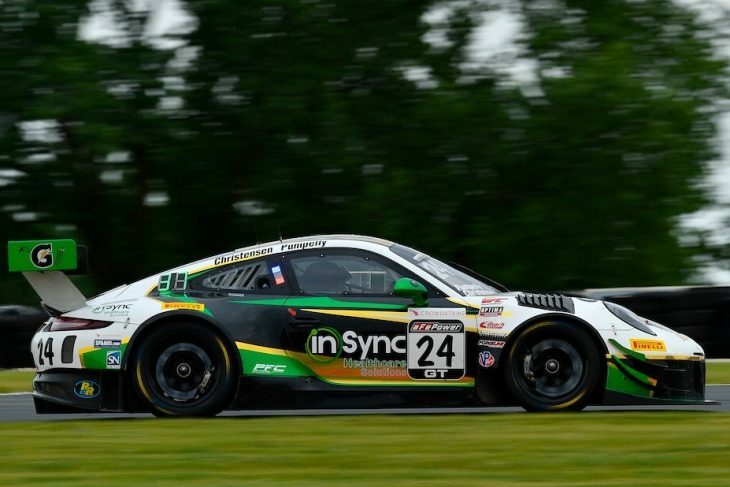 2018 GTE Pro Le Mans 24 Hours winner Michael Christensen continued winning ways in the second Pirelli World Challenge GT race of the weekend at Road America. Driving the #24 Alegra Motorsports Porsche, Christensen finished just 2.2 seconds ahead of Race 1 winner Alvaro Parente, who steered his #9 K-PAX Racing Bentley to a second place finish. Christensen’s win was relatively simple one after the opening lap. The start though, was frantic, the Dane muscling past pole-sitter Parente at Turn 6 up the inside to take the lead. After that, he didn’t look back, recording his second PWC win of 2018 after a GT SprintX victory with Spencer Pumpelly last month at Lime Rock Park. Even after the lengthy full-course yellow, Parente wasn’t able to mount a challenge, and finished second. The FCY was caused by a big accident involving the #2 GMG Audi GT4 of Jason Bell and the #77 VOLT Racing Mustang of Alan Brynjolfsson, Brynjolfsson turning Bell around, sending him into the barriers on the run up to Turn 6, with 34 minutes left. Thankfully Bell was uninjured. Third place meanwhile, went to Long Beach GT Sprint winner Daniel Mancinelli, driving the #31 TR3 Racing Ferrari 488 GT3. “The last two weeks have been pretty amazing for me,” said Christensen. 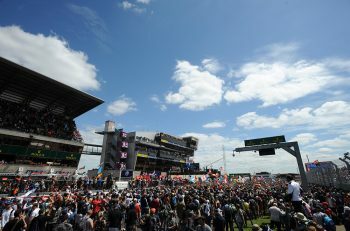 “Completing a career goal and winning at Le Mans was a dream come true for me and it’s an amazing feeling. We’ll try to keep it going and the car has been really good the last few races. So, we’ll keep at it. It was great to be back in front again after Saturday, which was a messy race for me. The start wasn’t great from the first row and then the re-starts didn’t really go to plan for anyone except for Parente. I was lucky to get a click-in a decent lap yesterday to get at least in the second row today. Completing the top-five GT finishers were GT Sprint point leader Scott Hargrove in the #96 Pfaff Motorsports Porsche 911 GT3 R and GT Overall points leader Toni Vilander in the #61 R. Ferri Motorsport Ferrari 488 GT3, the Finn sealing a top five spot after getting past Daniel Morad’s CRP Mercedes at the restart. While the GT lead battle never really reached a crescendo, there was plenty of action in battle for the GTA lead. Parker Chase managed to get the btter of Martin Fuentes’ Squadra Corse Ferrari in his TruSpeed Audi, to take the win, after a move at the last turn allowed him to run to pull alongside at the finish line, winning the class by jus 0.008 of a second. It was Chase’s second GTA Sprint win this season and third overall win in 2018. Third went to former GT Cup series champion Yuki Harata of Japan in the #55 Dream Racing Motorsports Lamborghini Huracan GT3. “On the re-start I really messed up,” said Chase. “From then I thought it was over. But when I saw the white flag, I really started pushing because I saw a lot of GTS traffic ahead. I knew that if I got there I would have a chance at getting around him. The GTS traffic really helped out in my favour. “Coming around turn 14, Martin was slower than me and I got a better run out of turn 13 and I just went for it. There wasn’t much room, but I did what I had to do so I just tried to go for it and it worked and we were side-by-side the whole way up the front straight. I didn’t even know who won – I had to ask one of the photographers. Meanwhile, in the GTS classes, it was Ian James who emerged victorious in the #50 Team Panoz Racing Avezzano, sweeping the weekend. 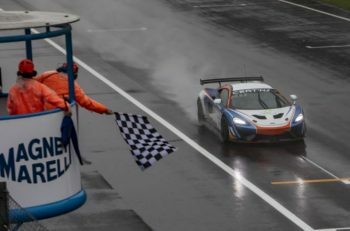 To record the victory, James – who started fourth – eventually had to hold off a strong challenge from GTS Overall points leader James Sofronas’s #14 GMG Racing Audi R8 LMS GT4 and Harry Gottsacker’s #69 Racers Edge Motorsports SIN R1 GT4. The top three ran nose-to-tail at the end, James able to hold both challengers back, as they scrapped for the podium places all the way to the flag. In the GTSA class, local favorite Jeff Courtney took his first class win in the #9 JCR Motorsports Maserati Grand Turismo GT4 over Mike Hedlund’s #45 Flying Lizard Motorsports Audi R8 LMS GT4 and Drew Staveley’s #12 Ian Lacy Racing Ginetta G55. The Pirelli World Challenge Championships now move to Portland International Raceway on July 13-15 with all eight series classes competing in its first PWC event at the track since 2006.